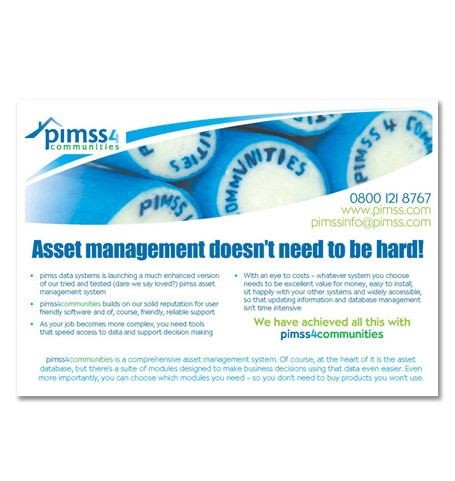 Utilising an existing identity we were asked to create a campaign to promote Pimss new software and the company's presence at an important trade event. Firstly we came up with the strapline 'Asset Management doesn't have to be hard' in conjunction with the idea of branded rock/candy. We sourced and produced sticks of rock with the Company name through the middle, which formed the basis of a teaser campaign where a stick of rock was sent to a select and targeted mailing list to encourage event attendees. Material to match was designed to reflect the rock and theme of the promotion, art directing photography and designing strong event material, with folders and press packs.